Recently a friend of mine asked me how I would play a 3-2 in the position above. My answer was instantly 8/6, 8/5. Then his question became more complicated (and was really what he wanted to ask in the first place). "How did I know when to play safe rather than to hit and try for the gammon?" I don't recall my exact answer (something like, "It depends on the position and the number rolled") except that it left my friend unsatisfied and appreciably no better off than he had been before. What this little encounter did make me realize, however, was how difficult it is to verbalize what is essentially a nonverbal process. Experts have so much experience and familiarity with backgammon positions that the step by step approach average players are required to go through to find an answer has largely disappeared from their own games. Nevertheless, that process is still there. It is just not as visible and is performed at much greater speed by top players than by lesser lights. The other thing I realized was that my friend thought that there were general principles I knew of that enabled me to instantly "solve" the problems in the position. That is an illusion and completely untrue (good players permit this impression, however, for purposes of ego and intimidation). There are no easy answers to finding good moves at backgammon. Experience and familiarity merely enable the expert to find good moves more easily. Each position must be broken down to its essentials, with the relevant factors weighed against each other to eventually arrive at a decision. To illustrate my point (and apologize to my friend for my previous vague answer) I then listed those factors (below) that I considered pertinent in assessing a position of the type shown. Experts of course will disagree on such a list but not significantly enough to alter the main argument. Need to make the point. Good chances of making desired point anyway. Chances of losing after being hit or of opponent getting off gammon after hitting. Playing safe at the cost of awkwardness. Concern over the opponent's defensive threats. 4-2 8/6, 8/4 C predominates. 6-2 8/2, 8/6 C again. 6-1 8/2, 4/3* G and A combined win out. 5-3 8/3*, 6/3 E and F (8/3*, 8/5 leaves too many shots next roll). 4-1 8/3* Can't stand H (6/5, 6/2); therefore left with G.
Though my model isn't perfect it does show, to some extent, how good players think about positions. Positions, numbers, and criteria for evaluating positions are in constant flux, but the procedure for choosing a move or making a decision in backgammon remains pretty much the same. What separates good players from weaker ones is greater understanding of the relevant positional factors in positions and greater skill in weighing them against each other to make decisions. To impart some flavor of this thinking process I gave my friend (and now you, the reader) the following exercise. The eight positions below are all very similar to our original. Your task is to play the numbers next to each diagram for Black and then evaluate your move using the criteria listed in the article. There is no correct set of solutions but your answers will reflect how you weigh the various factors to make your moves. If you wish to compare, my answers follow. P.S. You may include criteria of your own. I recommend this exercise if you have trouble organizing your backgammon thinking. Simply choose a position you don't understand, make a list of criteria you think apply to the position, and then choose your move in the position for all the numbers on the dice, including, of course, your own evaluation. Black to play 3-2, 3-1, 4-2, 4-1, 5-3, 6-1, 6-2. Black to play 3-2, 4-2, 4-1, 6-1, 6-2, 5-3. Black to play 3-2, 3-1, 4-2, 6-2, 6-1, 5-3. Black to play 5-1, 5-2, 4-2, 4-1, 5-3, 4-3. Black to play 3-2, 3-1, 4-2, 5-2, 5-1. Black to play 5-3, 4-3, 6-1, 6-2, 3-2, 3-1. Black to play 3-2, 4-2, 5-3, 6-1, 6-2, 4-1. Black to play 3-2, 3-1, 5-2, 4-3, 5-1, 6-1, 6-2. 3-2: 8/6, 8/5. Not enough of A, too much of C. If hit, prefer 6/3*, 5/3. 3-1: 6/3*, 4/3. Can't stand H, conforms to E and F.
4-2: 8/6, 8/4. C too strong. 4-1: 8/3*. Can't stand H again (6/5, 6/2) so left with G.
5-3: 8/3*, 6/3. E and F the main factors. 8/3*, 8/5 leaves too many shots next roll. 6-1: 8/2, 4/3*. Mostly G and A override E.
6-2: 8/2, 8/6. C too strong, overcomes other factors. 3-2: 8/6, 8/5. Still think C outweights all others. 4-2: 8/6, 8/4. Same as last move, C.
4-1: 8/3*. Can't stand H, therefore G + A wins out. 6-1: 8/2, 4/3*. Mostly G + A. 6-2: 8/2, 8/6. C again in spite of weak enemy board. 5-3: 8/3*, 6/3. F + B beats out E, plus it's safer next roll. 3-2: 8/6, 8/5. C again. 3-1: 6/3*, 4/3. H is out A + B + E + F vote for this. 4-2: 8/6, 8/4. C once again. 6-2: 8/2, 8/6. 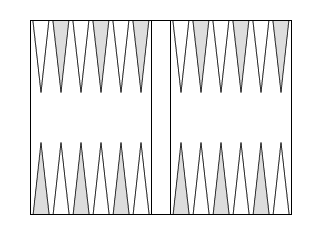 Still C.
6-1: 8/2, 4/3*. Mostly G with a little bit of A. 5-3: 8/3*, 6/3. A + B + E + F again. 5-1: 8/2*. A + B + G outweights D + E.
5-2: 8/3, 8/6. C + F give this priority. 4-2: 8/4, 8/6. C + F again. 4-1: 8/4, 3/2*. A + G stronger than D.
5-3: 8/3, 8/5. 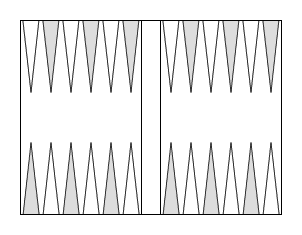 C + F.
4-3: 8/4, 8/5. C + F.
3-2: 8/6, 8/5. Mostly C in sprite of I (White rolling an ace). 3-1: 8/5, 3/2*. A + B + G + I wins out over H (6/5, 6/3) + E + E.
4-2: 8/4, 8/6. C mostly + E and D beat I. 5-2: 8/3, 8/6. Same as last move. 5-1: 8/2*. G + A. 5-3: 8/3*, 8/5. A + I + B in preference to H.
4-3: 8/4, 8/5. Mostly G, willing to risk I (deuce by White), will not break bar. 6-1: 8/2, 4/3*. Rule out H for A + B + I. 6-2: 8/2, 8/6. C beats out I + A, A very close decision for me. 3-2: 8/3*. I + A now over C because of extra builder; very subjective. 3-1: 7/6, 7/4. Cover I. For me this is virtually pick 'em between this or 8/5, 4/3*. Don't know for sure. 3-2: 8/6, 8/5. C beats out I + A. 4-2: 8/4, 8/6. Same as last move. 5-3: 8/3*, 6/3. A + G over E + F.
6-1: 8/2, 4/3*. G + A. 6-2: 8/2, 8/6. C over I. 4-1: 8/3*. Can't stand H, therefore G.
3-1: 6/3, 5/4*. A over H.
5-2: 8/3, 8/6. C as usual. 4-3: 8/4*, 8/5. Rule out H leaving G + A. 5-1: 8/3, 5/4*. Mostly G + A over E.
6-1: 8/2, 5/4*. G + A over E.
6-2: 8/2, 8/6. Again C.